Owning a good house is perhaps the first material aspiration of a person. With blessings of God and good wishes of elders, man acquires a house wherein he wants to live in comfort and harmony with family and society. Every place has its own energies, through Vedic prayers; we synergize such cosmic forces for our peace and welfare. Moving to a new house is among the four most precious events of our life that include birth, marriage, first employment and dwelling. Shubhpuja organizes this special puja to celebrate the occasion and seek the blessings of God for happiness of all the members of household and to save us from jealousy and evil eyes. We send you a qualified pandit trained in Hindu Shastras to conduct puja at your preferred location and the time or muhurat time suggested by Shubhpuja. 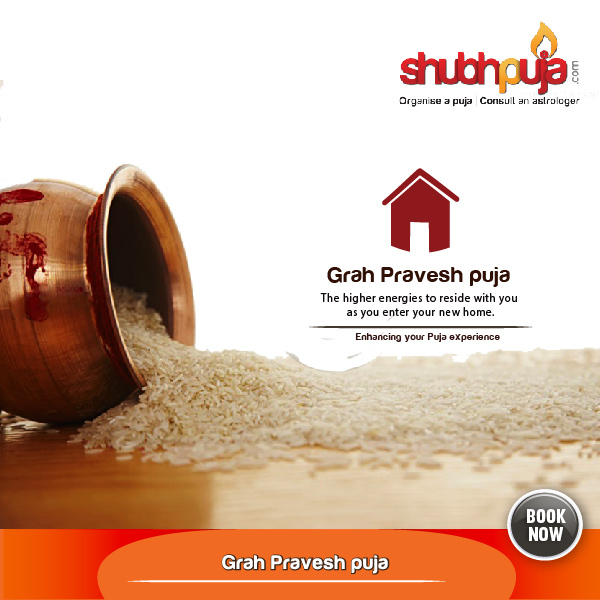 Shubhpuja also takes the initiative of providing you with the puja samagri at its actual price! The most outstanding part about our service is the availability of Online Live Pujas and offer blessings to the god on your behalf for customers based outside Delhi NCR. This entry was posted in Puja and tagged fight evils, Grah Pravesh, Hindu, House, new, New Home, Personal Occasion, puja, Purity, rituals, Shubh, shubhpuja. Modern day numerology suggests that the name and meaning of child has life-long influence on the career Paath, events and destiny of person. Vedic astrology indicates the first letter of the name of child as per the birth chart. Just like christening of child is very important in Christian religion, it is important that we invoke blessing God through yagna and finalizing the name of child in consonance with esoteric forces according to the Hindu Vedas. Through this ceremony, the family members, friends and relatives participate together and accept the new arrival in society with their affection and blessings. This is a function of the ceremony is also for guardian devas (angels) to connect with the individual so they can start guiding him or her in their life. The Namakarana samskara can be a simple or elaborate ceremony. This ceremony is conducted to christen the child as per Hindu vedas and religion. In this ceremony, parents and family members of the child can give the blessings and give their wishes for the bright future of the child. From Shubhpuja’s end, we send you qualified pandits to perform this auspicious ceremony in the most elaborate manner to reap the best benefits for your child. We even take care of the Muhurat and Samagri, in case of that need. Shubhpuja has a set of of highly qualified pandits, trained in Jataka Shastra and are capable of giving you high-level spiritual experiences! This entry was posted in Puja and tagged baby boy, baby girl, baby name, ceremony, Hindu, hindu baby, Naam sanskar, Name, Namsankarana, puja, rituals, Shubh, shubhpuja. Every event in child’s development is an occasion of blessings of god and family members. Mundan ceremony is performed as the time of the first hair-cut of newly born child. Growth of new hair heralds the faster growth of child and their inception into society. Mundan, also known as Chudakarana literally means- arrangement of the hair tuft is the eighth of the sixteen Hindu sanskars (sacraments), in which a child receives his/her first haircut. Shaving the head according to Vedic shastras means enhancing the longevity or the life span of the child. The child’s hair at the time of birth is not strong and the mundan ceremony ensures that hair roots are strengthened and strong hair is formed. The first hairstyle is an essential ritual and cutting the child’s hair eliminates previous life negativity of the kid. According to the Grhya Sutras, this samskara should take place at the end of first year or before the expiry of the third year, but the later authorities extend the age to the seventh year. The child’s hair is shorn, frequently leaving only the sikha or cūḍā, a tuft at the crown of the head. Special yagna is organized and puja is performed on this occasion to bless the child. To perform this ceremony, a havan is conducted by panditji and the head of the child needs to be washed with Gangajal. After that the shaved off hair are offered to River Ganga. Shubhpuja specializes in the very puja and sends out to you our most qualified Pandits to perform the ritual. These Pandits are highly qualified and experienced in all performing all sorts of rituals and even add on to your knowledge of the same. This entry was posted in Puja and tagged baby, baby rituals, Chudakarana, first hair cut, hair-cut, hindu rituals, mundan, mundan puja, new born, puja, rituals, Shubh, shubhpuja. Celebrating your birthday? Or the birthday of someone close to you? Done with all the décor and gifting preparations? Decided what you’re going to wear? Done with the guest list? Is the cake on its way? Your preparations for your ‘Big’ day are yet not complete! Did you remember to thank the very God who has bestowed his wishes upon you since forever? Have you decided the way to seek his blessings for the coming segment of your life as well? Every new year in your life is a period of rejoice and new aspirations. We must pray to seek the blessings of almighty to give us success, energy and new aspirations. 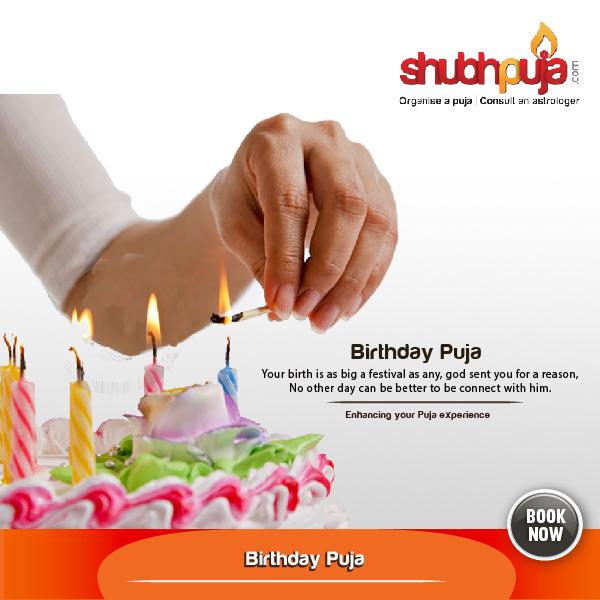 Shubhpuja organizes special puja on birthday based on the teachings of our ancient sages that will bring joy and happiness in the coming year of your life. It is important that we remember and thank god who is our creator on this special day in our life so that his blessings continue to be bestowed on us throughout the year. 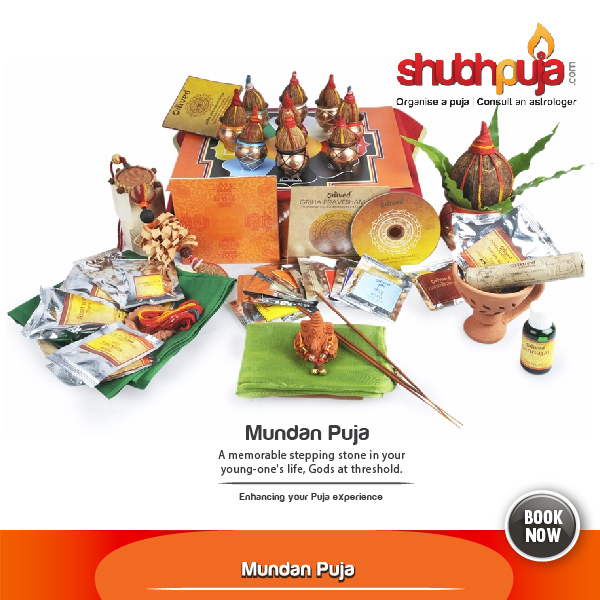 Shubhpuja makes it easy for you by sending a qualified pandit trained in Hindu Shastras to conduct puja at your preferred location (home, office etc.) and time (or muhurat time suggested by Shubhpuja). It’s the perfect time to make the rest of your life, the best of your life! This entry was posted in Puja and tagged Birthday, Birthday Puja, celebration, diversity, Festival, god connect, Hindu, occasion, Personal, puja, rituals, Shubh puja. Also known as Akha Teej, Akshaya Tritiya is a holy day for Hindus and Jains. It falls on the third Tithi (lunar day) of Bright Half (Shukla Paksha) of the pan-Indian month of Vaisakha and one of the four most important days for Hindus. It is an auspicious day of the birthday of Lord Parasurama who is the sixth incarnation of Lord Vishnu. On this day Veda Vyas and Lord Ganesha began to write Mahabharata. The meaning of the word Akshaya is infinite that which never recede. Nowadays jewellers have turned the purity into a marketing gimmick. The day is considered auspicious for starting new ventures. The legend is that any venture initiated on the auspicious day of Akshaya Tritiya continues to grow and bring prosperity. Hence, new ventures, like starting a business, construction, etc. is performed on Akshaya Tritiya. As per Hindu electional astrology (Muhurta) three lunar days (tithis) are auspicious. These are called Sade-Teen Muhurtas also. These Tithis are first Tithi of Bright Half of Chaitra(starting of new year), tenth Tithi of Bright Half of Ashvina (Vijay Dashmi), third Tithi of Bright Half of Vaishakha (Akshay Tritiya- Parshu Jyanti) and first Tithi of Bright Half ofKarttika are called “Sade-Teen (3 ½) Muhurt”. The first three tithis are counted as full and the last one as half Tithi and constitute Sade – Teen Muhurt. Sun and moon are astrologically believed to be at their most exalted equal brightness on this day. Worldly activities can be initiated during currency of this Tithi, however, aspirants must ensure that duration is not sullied by concurrence of malefic times observed according to the Hindu electional principles, and the moments are favourable to the doer by transits of the planets and the like. Aspirants are cautioned against using this Tithi blindly for initiating and conducting all types of life activities. Auspiciousness of the Tithis for specific activity depends upon simultaneous presence of Panchangam Shuddhi, Muhurt Yogasand host of other elements of Hindu electional astrology. The gold rush of Akshaya Tritiya is now a phenomenon that manifests every year with a certainty that pays no heed to mundane changes in economic fortunes. But the observance of the auspicious day has in recent times shed its multiple characteristics and come to be viewed only as an auspicious day to buy gold. Akshaya Tritiya is an important day in the Hindu calendar. It is the third day of the waxing moon in the month of Vaishaka. Its auspiciousness arises from the belief that one year in the life of humans is equivalent to a day in the lives of celestial beings. So, the month Vaishaka is considered the morning of a celestial being’s day. This, combined with the waxing of the moon is a symbol of the rising energies that will last through the year. According to the scriptures, the celestial specialty of Akshaya Tritiya makes it a particularly good day for four kinds of activities. They are Yajanam (performance of auspicious activities like yagnas and homams), Yaajanam (enabling the performance of auspicious activities by others), Dhaanam (charity) and Pratigraham (acquisition and accumulation of wealth of any sort). This entry was posted in Puja and tagged Akshaya, Akshaya Tritiya, amazing, concept, festivals, glory, gold, Hindu, hinduism, modern, puja, rituals, Shubh, shubhpuja, Tritiya. Birth of a child is the most joyous occasion for any family. Children in a significant way reflect upon whatever they’ve been taught since they’re born, however, individuals do bring their destiny with them. It’s only once they attain wisdom they are responsible for shaping their destiny themselves. However, up till the age of six, special care has to be taken pertaining to the health and welfare of the child. At this age, children cannot take a decision for themselves. Thus, parents are primarily responsible for grooming them and taking decision on their behalf. During this critical period, the parents should consult astrologers to find out the favorable astrological planetary positions through the kundali of the child. The astrologers will also advise you as to how your own fortunes will be improved with the arrival of new member in your family. This is a highly effective and important exercise that is recommended by panditjis all over the world. We provide astrological services to people living in India and abroad. We have a mix team of highly successful professionals (with knowledge of astrology) and educationally qualified shastris in Jataka Shastras who have given advice for a bright future of the child. This entry was posted in Puja and tagged babies, child, child kundali, children, future, Hindu, hindu kundali, horoscope, kundali, preparation, puja, rituals, Shubh, shubhpuja.